Shawn Purcell (B.M. Technology, 1993) is a native of Pittsburgh, Pennsylvania. He is a graduate of Duquesne University where he was awarded a Bachelor of Music in Recording Arts and Sciences in 1993. In 2006, Purcell earned a Master of Arts in Music, with an emphasis in jazz composition and arranging, from Middle Tennessee State University, and in 2011, he completed a Doctor of Musical Arts in Jazz Performance with a minor in ethnomusicology from the University of Illinois at Urbana-Champaign. Purcell is a jazz guitarist, bandleader, arranger, composer, and educator. He has been active as a featured soloist with small ensembles and jazz big bands, and he has shared the stage with many of the world's top jazz artists including: Ingrid Jensen, Nicholas Payton, Tim Warfield, Terell Stafford, The Chicago Jazz Ensemble, Alan Baylock Jazz Orchestra, U.S. Army Blues Jazz Ensemble, The Capitol Bones, Jim Pugh, Chip McNeill, Dana Hall, Jeannie Bryson, Eddie Daniels, Bob Berg, James Moody, Jerry Bergonzi as well as many others. Purcell has served on the jazz faculty at Towson University, Middle Tennessee State University, and was a Visiting Lecturer in Jazz Studies at Indiana University, Bloomington, under the direction of David Baker. He has held master classes at Universities and Workshops across the United States, and is regular columnist for Jazz Guitar Life and Down Beat Magazine. 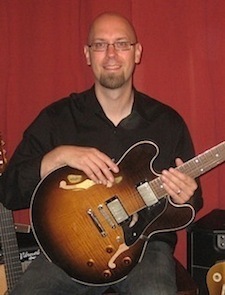 From 1996-2004, Purcell was the guitarist in the United States Air Force premier jazz ensemble, The Airmen of Note, based in Washington D.C. During his nearly eight years with "The Note" Purcell performed throughout the United States as well as overseas. International tours included England, Germany, Turkey, Luxembourg, The Azores, Belgium, Oman, Qatar, United Arab Emirates, Italy, Kuwait, and Bahrain. In 2013, Shawn auditioned and won the position as guitarist with the U.S. Navy Band "Commodores" jazz ensemble in Washington D.C. Purcell also currently serves as adjunct professor of jazz studies (jazz guitar and jazz arranging) at George Mason University.